When it comes to trying new things Sunliner isn’t afraid of thinking outside the square. Witness the new Habitat: Not a true off road motorhome , Sunliner describes it as a long-range, rough-terrain, touring motorhome designed for the serious RV traveller. “We’re incredibly excited about this new Motorhome,” says Nick Hunter, Sunliner’s managing director. 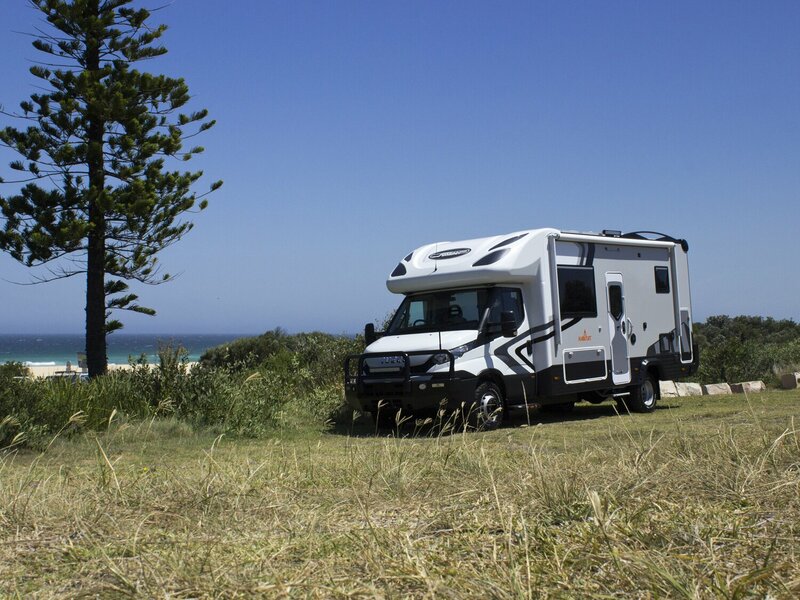 “We spent 12 months in research and design, talking to our customers and carefully studying what RV travellers want. We listened to their frustrations and worked to overcome them. There were four major considerations for the Habitat: the ability to get ‘off the grid’ for as long as possible; the types of terrain to be negotiated; storage capacity, and security while free camping,” Nick says. The Habitat’s new approach is obvious from first sight. Its military grade appearance includes chequer plate body panelling, a black steel bulbar and heavy-duty rear bumper -and that’s just for starters. There’s all-terrain tyres, roof-mounted LED light bars on three sides, a bullbar-mounted aerial for the UHF CB and a dash-cam. All of this is standard. The Habitat rides on the latest Iveco Daily 70 C170 cab-chassis and has a 7000 kg GVM derated to 6500 kg. Fortunately that still leaves a generous 1500 kg payload capacity. Just be aware you’ll need a Light Rigid (LR) licence to drive it. Contrary to appearances there is no suspension lift; any increase in the Iveco’s already good ground clearance comes from the all-terrain tyres. This model Daily comes with the single turbo version of Iveco’s signature 3.0-litre 4-cylinder diesel, producing 125 kW and 430 Nm. Although Iveco offers a 150kW/470Nm twin-turbo option it really would be overkill. The reason is ZF’s Hi-Matic 8-speed fully automatic gearbox, which seems to have a ratio for every occasion and operates with silken efficiency. Given the Habitat’s all-road/rough-road ambitions this transmission choice is perfect, as an automatic is better suited to loose/soft/rocky conditions due to its smooth power delivery, which reduces the chance of wheel spin. Importantly, the Habitat comes with the Daily’s optional differential lock, which adds a considerable degree of ability in the above conditions. Combined with the extra grip of the excellent BF Goodrich all terrains (tyres I have extensive off-road experience with and can’t recommend too highly), the Habitat will likely go further than most owners will dare venture or find out. Impressively, these tyres are quiet on bitumen, grip well in the wet and are long wearing. Adventuring is what the Habitat is all about. For starters it has a huge 210 litre fuel tank (think an easy 1000-plus km range), 400 litres of fresh water and enough electrical oomph for you to become a remote power station: 300 amp-hours of house battery capacity backed by 300 watts of solar, plus a 2.9 kW petrol generator included for good measure. If you need to run your hairdryer and Nespresso machine a 3000 watt inverter will let you do both and more – at the same time! Sunliner reckons the capacities provide at least five days of self-sufficient camping. Depending where you’re parked, however, the small 100 litre grey water tank will be the limiting factor if you can’t legally dump it, along with the 19 litre toilet cassette. Perhaps for this machine a 100-odd litre black water tank for the toilet would make more sense… The Habitat has considerable external storage by way of a full-width rear boot that has a floor-to-ceiling section on the driver’s side said to be ideal for snow skis, fishing rods or even a surfboard. The boot is also pressurised via a fan to minimise dust ingress. 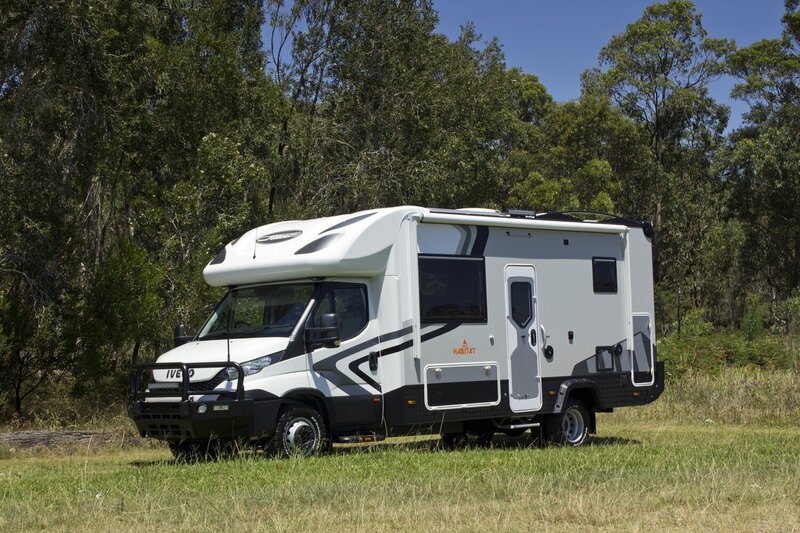 While a motorhome provides significant security advantages over other RV types, because you can jump into the cab and drive off, the Habitat takes things further. It comes with a new Quick Evacuation mode that at the touch of a button turns on the LED flood lights, raises the rear stabiliser legs, retracts the electric awning and entry steps, and let’s you hit the road in around 90 seconds. Very clever. 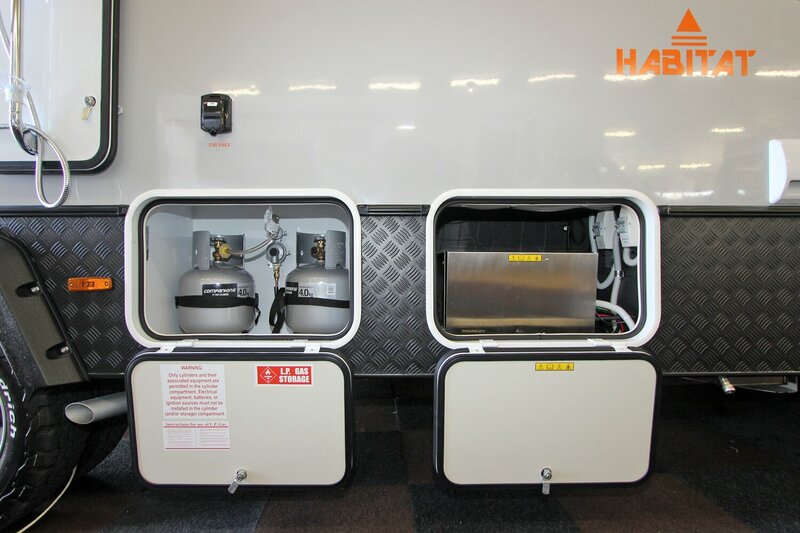 It also includes lockable water and generator fuel fillers, a security entry door and high-set windows. 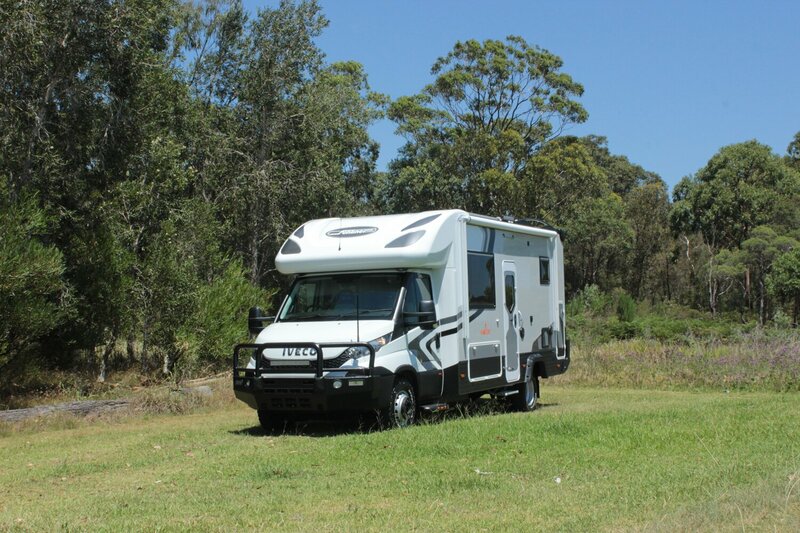 The Habitat is a four-seat four-berth B-class motorhome. 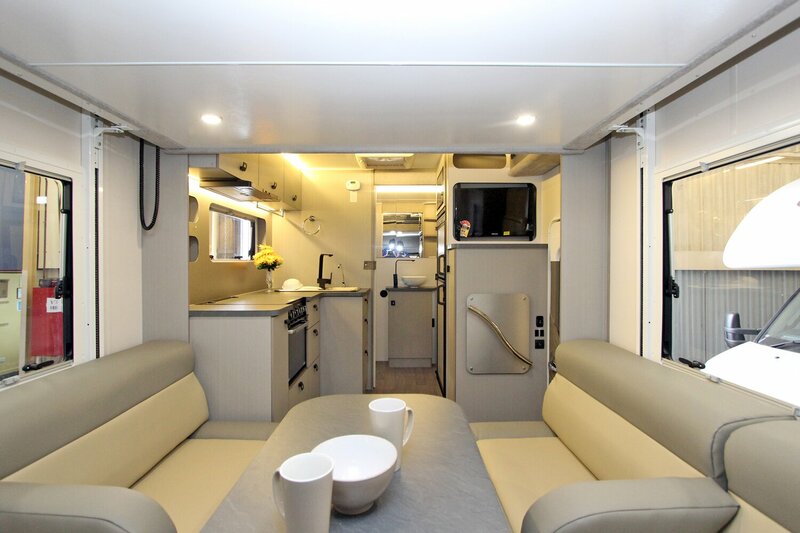 The floorplan features a pair of swiveling cab seats, integrating with two long sofas that double as single beds. The main bed lowers from the roof above them. It has a mid kitchen (with the entry door opposite) and full-width bathroom, behind which is storage. While certainly not “tough” inside, the military-grade theme continues with satin finishes designed to reduce dust appearance, plus things like satin-finished black taps and shower fittings (except the external shower, which oddly is a chrome domestic-style unit that’s been cleverly mounted inside a swing locker door). The rest of the decor is stylishly muted in a mix of earthy tones to reinforce the Habitat’s ‘serious’ nature, but with enough highlights to reflect the model’s upmarket positioning and inclusions. A well proportioned removable table provides good dining space and can be left in place when you lower the roof bed, should there just be two onboard. The electrically lowered roof bed is 1.83 m x 1.83 m, which is bang-on 6 feet in the old language but a bit short for some people these days. At the very rear, the bathroom is a good size and comes with a large, separate shower cubicle. Additionally, across the rear wall are deep mirror-fronted cupboards with shelves and a half-height wardrobe. 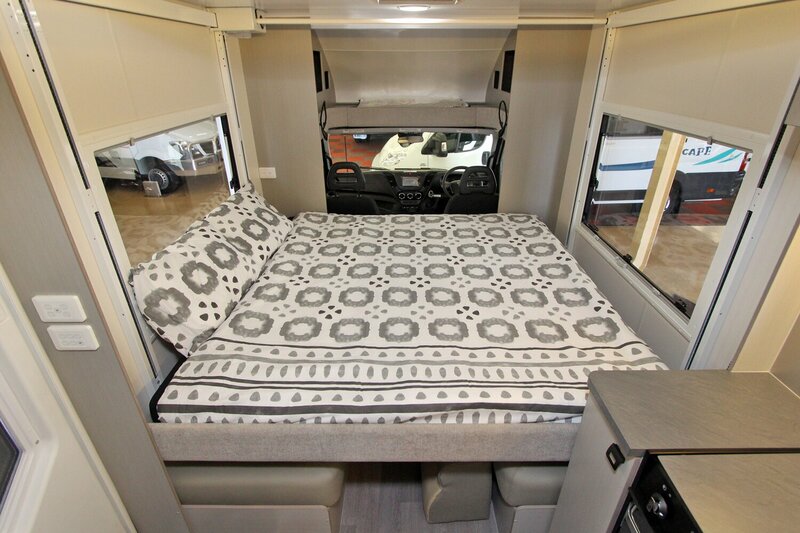 This is the first serious entrant in a new motorhome class that’s certain to become popular. If you have remote travel ambitions without venturing too far off the beaten track, the Habitat could let you achieve them, without sacrificing comfort and convenience. Go here for all the Sunliner Habitat specifications. 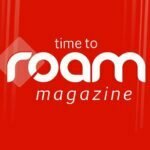 Go here for more motorhome reviews. Im a bit confused. Its not 4wd so it will have limited off road capability. Why not just make it 4wd so it does ? 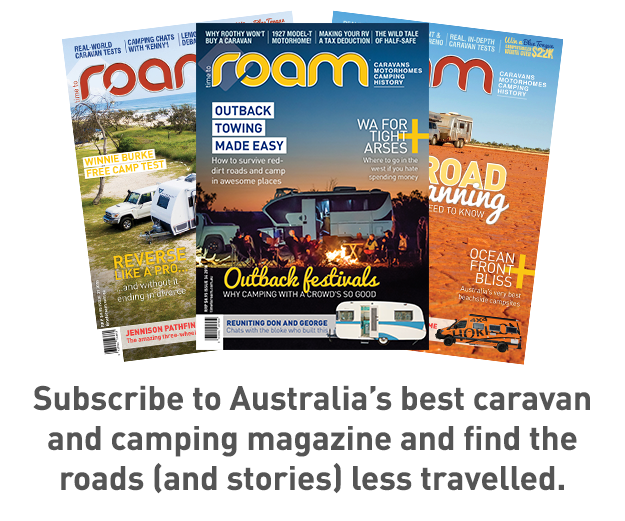 Much Like everything else in the Australian motorhome industry, It’s all smoke and mirrors, There is no industry watchdog, so Manufacturers either make totally outlandish claims or pay for reviews! Has anyone had trouble with their 2.9 kva running their aircon in their Habitat? Is there any cupboard space for storing of clothes? I’m aware there is hanging space behind the mirrors for clothes.